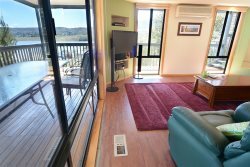 Mogul is a quaint 3 bedroom lakefront cottage at East Jindabyne. Reminiscent of holidays past. This is a second generation family holiday home. Gardens tendered with love and consideration make wandering to the shoreline a must in the early evening light. After, relax on the huge deck to tell tales of the days exploits while a steak sizzles on the Weber BBQ. WiFi has been added for you to enjoy. The interior of the cottage has a familiar air just like visiting favorite aunts on holidays. 2 bedrooms and an original bathroom are reached by a circular vertical staircase from the lounge area. Downstairs is the main bedroom with another functional bathroom. The remodeled kitchen has everything provided to construct your holiday meals. Relax in the comfortable lounges in front of the slow combustion wood fire. Additional heating and cooling during summer is with air conditioning throughout the cottage. Fishermen love Mogul due to its direct access to the lake and parking for your boat. Surrounding facilities include two hotels, a well stocked general store/bottle shop and service station.One of the areas best restaurants is just down the road. A great coffee and cake is just up the road! A ten minute drive to the centre of Jindabyne and an easy forty minute (clear weather) drive to the ski resorts of Thredbo and Perisher. Mogul cottage has been enjoyed by generations of families looking for a holiday lakeside in a quite area. Luxury bathroom amenities and towels provided. The team at Ray White Jindabyne are incredibly knowledgable and know how to make you feel welcome! Excellent communication and extremely friendly. Cant fault it. We had the best time at Mogul. It has been the best property we have stayed at in Jindabyne and we come every year for skiing. We will definitely book here again for next year. I loved working with Peter, I will definitely use him again. Lovely and clean, happy to stay here again. They are a pleasure to deal with.We have rented holiday accommodation through Joan and Peter for many years and they always provide friendly service and are always available and helpful. We will no doubt stay there again next year. Joan and Peter were lovely, very accommodating and easy to get in touch with. Peter and Joan were brilliant as was the place. Booking and check in were hassle free even though it was Christmas Day. The place was well appointed, clean and as described in AirBnb. We loved the stay and will not hesitate to stay at the Mogul whenever we go back to Jindabyne.